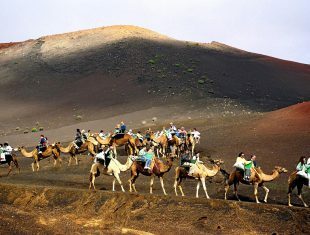 Lanzarote has something different that goes beyond what can be found in any destination of sun and beach. An island where nature and art go hand in hand, a place where people feel and live the commitment and pride of belonging to it, where food tastes of sea and countryside, an island whose essence leaves its mark . Welcome to the Lanzarote Effect. The conservation of cultural heritage is rooted in the history of Lanzarote and its people and make it a place that seems destined for dreams. In Lanzarote, their lifestyle adapted to the volcanic conditions of the land has been able to take advantage of the possibilities that the ash fields have for agriculture. Its vineyards emerge from large craters in the earth and give shape to a characteristic lunar landscape that together with the volcanoes and the sea testify to the deep commitment of the island with strict environmental codes of development. 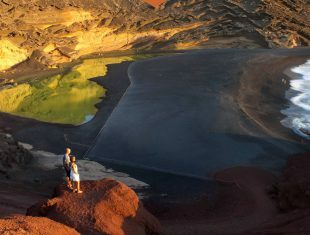 El Charco Verde, lago Verde, Charco de los Clicos o laguna de los Clicos, es una laguna declarada reserva natural que se encuentra en la población de El Golfo —municipio de Yaiza—, dentro del ámbito del parque nacional de Timanfaya de la isla de Lanzarote.